White O'Hara is a large, French, white rose, with a slight ivory tinge at the center, that opens up fully in a quartered way. It is very fragrant and wonderful for weddings and special events. It is hardy to ship and its vase life is extraordinary. A fantastic white garden rose with a hint of blush in the center! Vase Life: 3-7 days, depending on care and handling. Length: Our Garden Roses are 12-24 inches long. Garden Roses include one head per rose and our Spray Garden Roses come with 3-5 blooms per stem. Garden Roses are usually packed in 12 stem bunches. Spray Garden Roses include 10 stems per bunch. Diameter: Spray garden roses have an average diameter of 1.2 to 1.6 inches when closed and approx 2 to 2.8 inches diameter when opened. The single stem garden roses have approx 2.1 to 2.4 inches diameter when closed and approx 3.1 to 3.9 inches diameter when opened. - Garden roses don't like extreme locations - don't freeze them in a cooler or refridgerator that is too cold, and don't let them burn up in a sunny location. - Keep checking that the water level in the vases doesn't get low. Sometimes roses surprise you with their thirst! 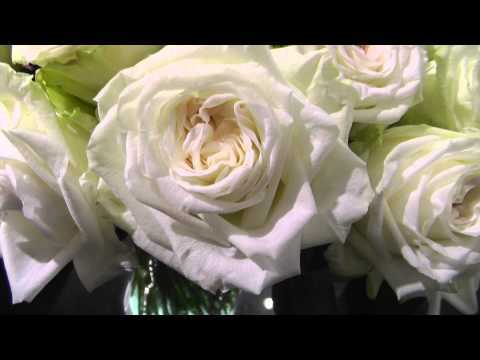 If you are ordering garden roses for a wedding or event, we recommend that you select a delivery date that is 2 to 3 days before the event date. For example, for a wedding on a Saturday, your flowers should be delivered on the Wednesday or Thursday beforehand. This is to give your flowers enough time to rehydrate and fully open.